Survey Results & Analysis (So Far) – Tellusthepoint. To view survey results, please log in. If you are not yet a member of Tellusthepoint, please register and join us. Requests to complete the survey were sent out primarily to city managers and mayors, so many of the respondents are city employees. City governments were chosen because in many cities the government is one of the largest employers, and cities employ workers in many different industries. Over 30 cities participated in the survey. 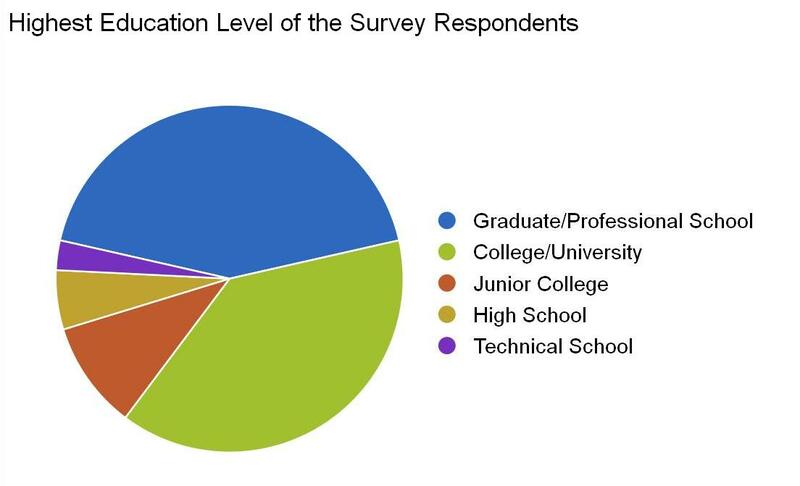 Number of Graduates: 508 graduates have completed the survey as of April 30, 2014. The occupations of respondents included city managers, mayors, engineers, policemen, firemen, attorneys, architects, accountants, analysts, scientists, marketers, clerks, receptionists, among others. 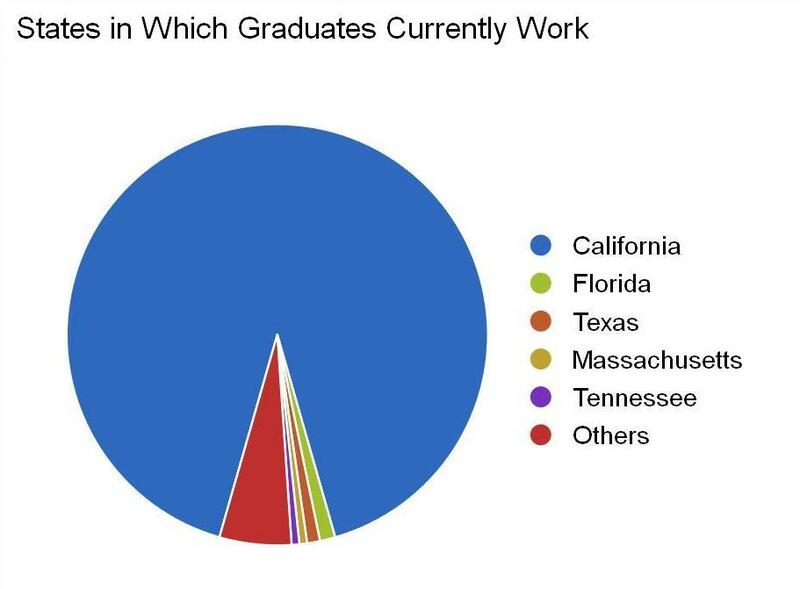 Locations of Graduates: Graduates from 25 different states are represented in the survey. 91% are from California. California cities included Los Angeles, Rosemead, Brea, South Pasadena, Irvine, Buena Park, Torrance, Upland, among others. Other states were Florida, Texas, Massachusetts, Tennessee, among others. Education of Graduates: The highest level of education of the graduates ranged from high school to graduate school. 82% had a college degree or higher. 43% had graduate or professional degrees. 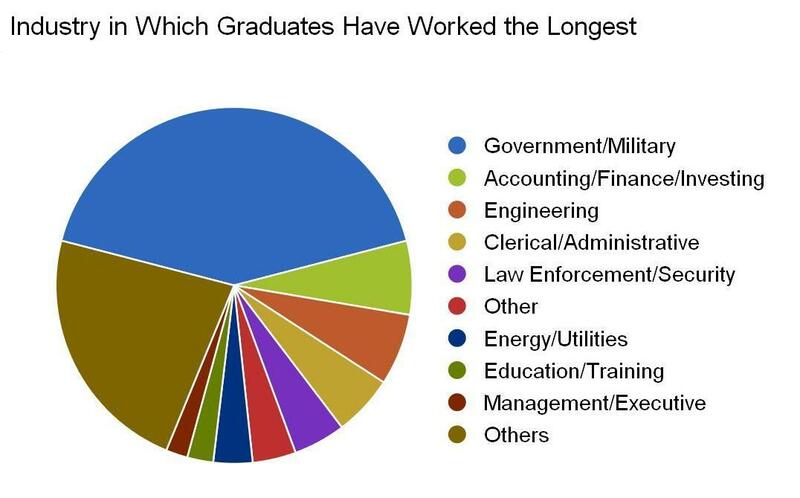 Industries of Graduates: Respondents reported that they worked in 47 different industries. The most common was the government/military industry (42%). Other industries were education, banking, construction, real estate, food services, social services, insurance, tourism, retail, fashion, hospitality, oil & gas, utilities, automotive, theater, healthcare, television, among others. 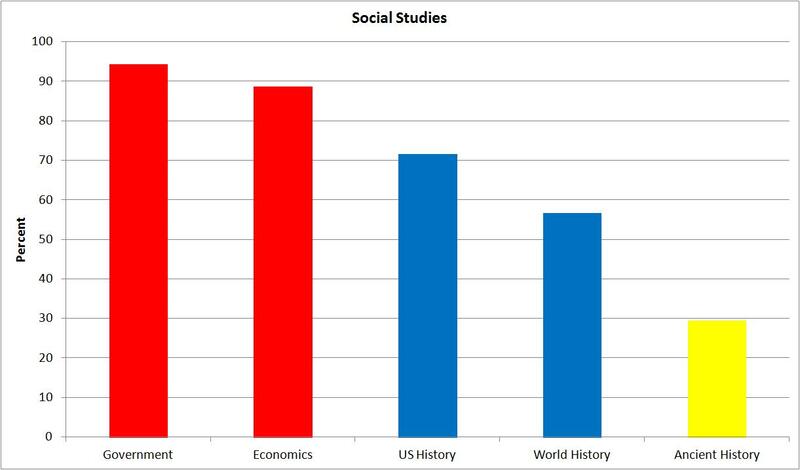 Results: The academic subjects required in all high schools: math, science, English, and social studies, all scored highly. 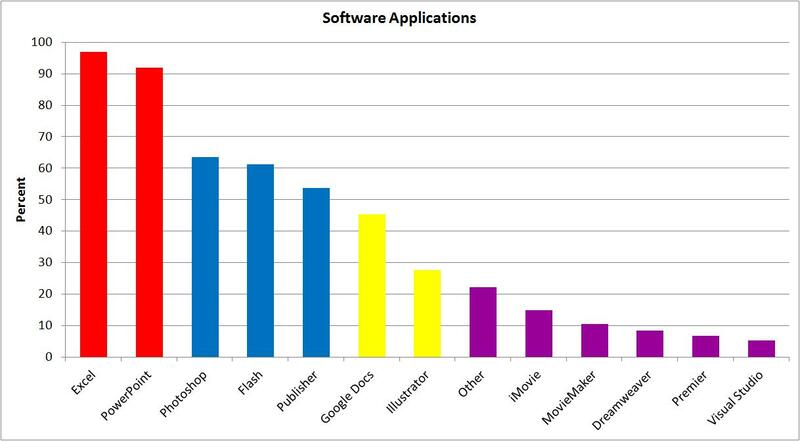 Computer software applications also scored extremely high. 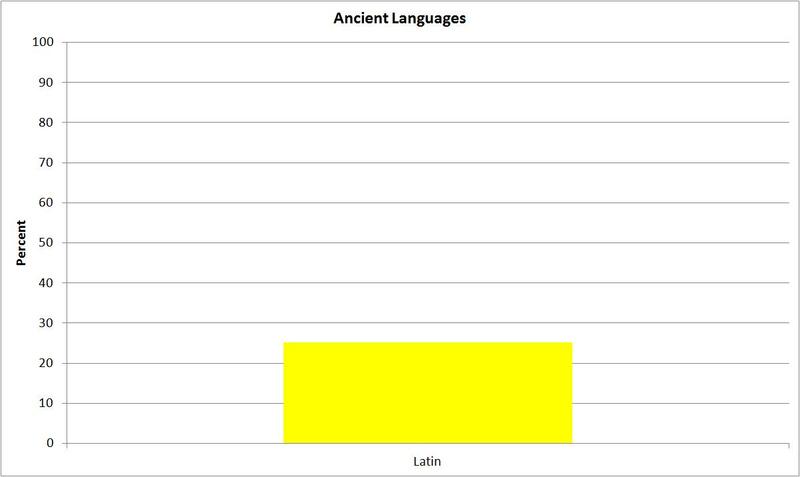 Art and sports also received relatively high scores compared to ancient foreign languages, the only subject few people reported using. 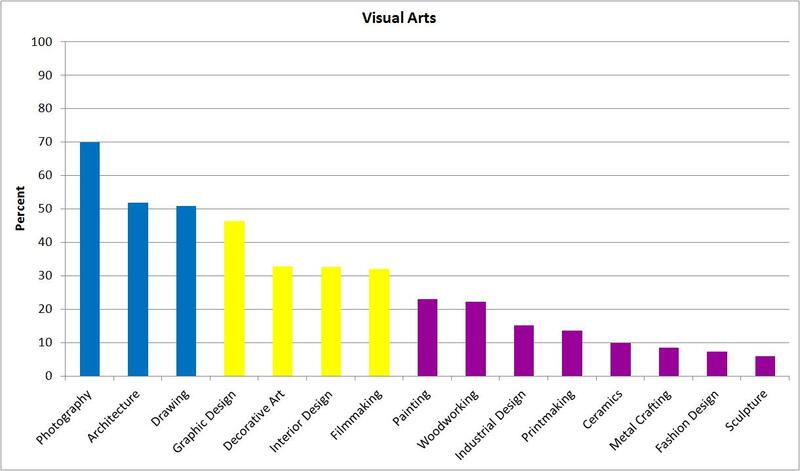 Implications: Visual arts, performing arts, and both individual and team sports scored fairly highly. Traditionally, these subjects aren’t considered as important as academic subjects, but the survey suggests that many people find them useful. This begs another question: how are so many people using these subjects in their lives? Does knowledge from those classes directly help people succeed in their jobs and in life, or do the subjects only give graduates a better understanding of the world, or simply help them build character traits such as confidence and perseverance? The survey has now been modified to ask graduates how they use the subjects they select, so hopefully these questions will be answered soon. 1. Calculate the percentage of people who answered each of the five answer possibilities for the “How Often I Used It” section for one subject. 3. Add these numbers up and divide the sum by 5. 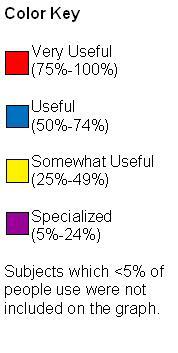 This result will be the weighted average usefulness score, with numbers ranging from 0 to 100. This score only rates the average usefulness; a subject may be widely used by many people but receive a low score because it is not used frequently (such as foreign languages). 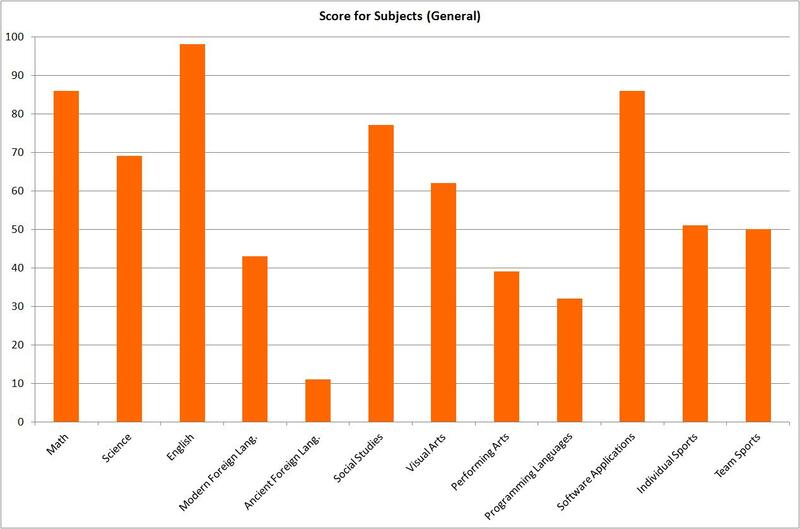 Other subjects may receive low scores because they are specialized knowledge, even if they are crucially important to people in certain fields (such as computer programming). Graduates were asked to select the subjects they used in life from a list of the subjects commonly taught in schools. 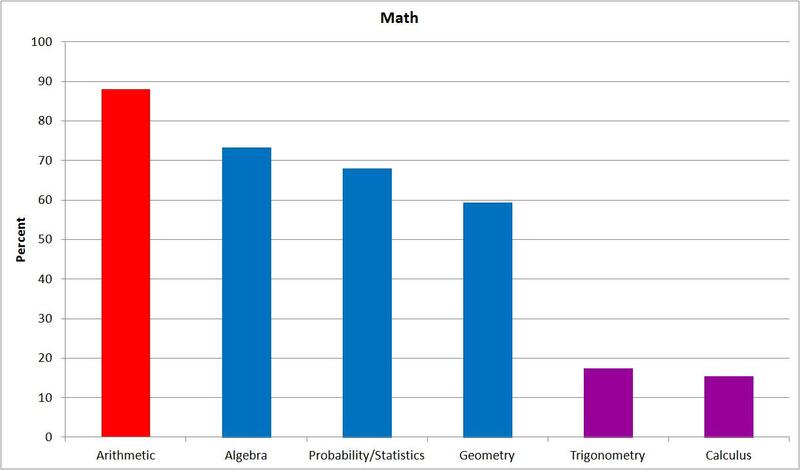 Results: Many subjects had extremely high percentages (such as algebra at 73% and astronomy at 21%). These numbers seem unreasonably high. It is unlikely that one fifth of the population actually uses astronomy to succeed in the work world. Instead, general astronomy knowledge may give people “common knowledge” which contributes to a better understanding of the world. More testing is needed to determine which subjects are actually a crucial part of the person’s success. The survey has now been changed to ask the importance of each specific subject, so soon it will be possible to determine which subjects are truly the most important. 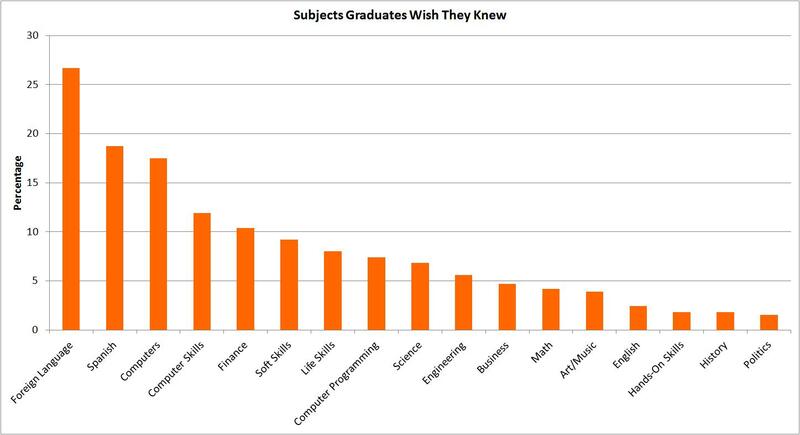 Implications: 73% of the graduates surveyed reported that they used algebra in life or work. A percentage that high suggests that the high school standard requiring all students to pass algebra to graduate is justified and should not be changed. Spanish was also ranked extremely highly. Spanish is certainly more useful than any other foreign language in California, where most of the survey respondents live. 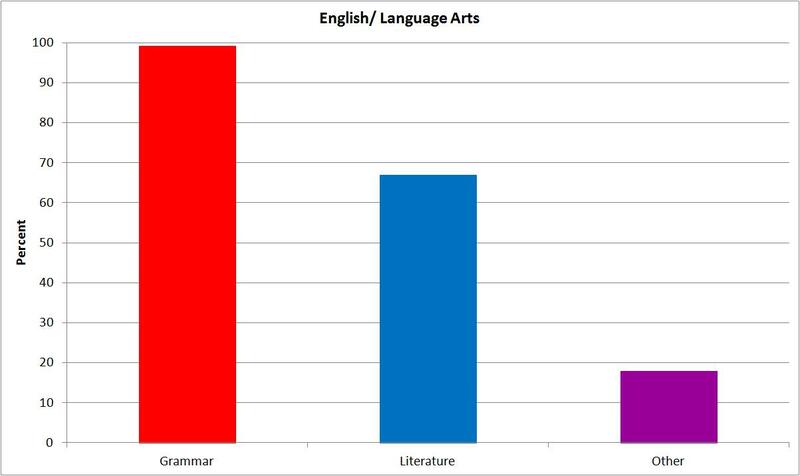 The results suggest that students should opt to take enough Spanish courses to become fluent in the language. For the five most common industries reported, we performed a statistical analysis comparing how often people in that industry reported using subjects with how often the rest of the survey respondents used them. 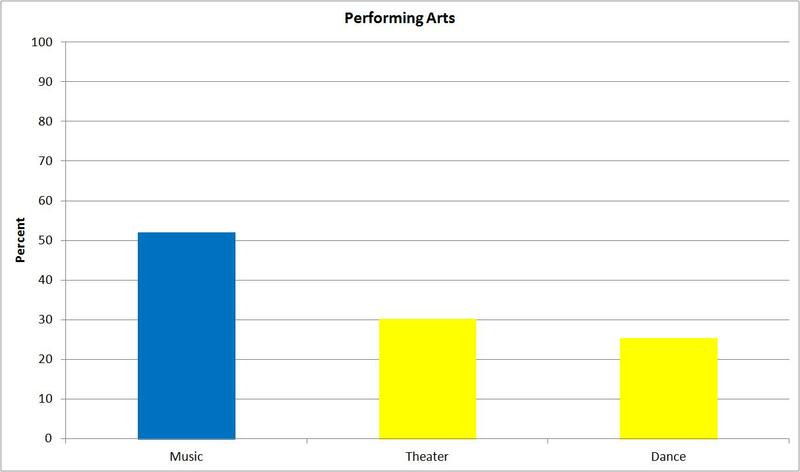 The statistically significant results are shown below. Graduates responded to an open-ended question asking them to list knowledge they did not learn in school but wish they had learned. Results: 337 people answered this open-ended question. 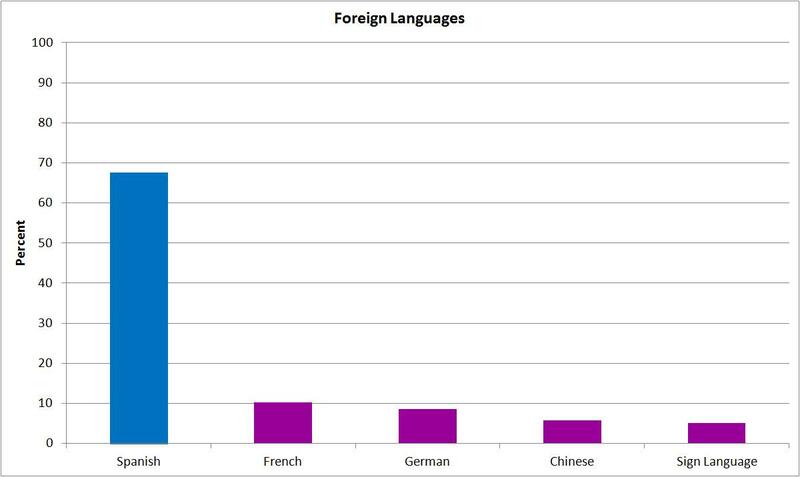 Some gave multiple responses, while a few answered “N/A” or “none.” The highest-mentioned subject was foreign languages, with most of the responses specifying Spanish. 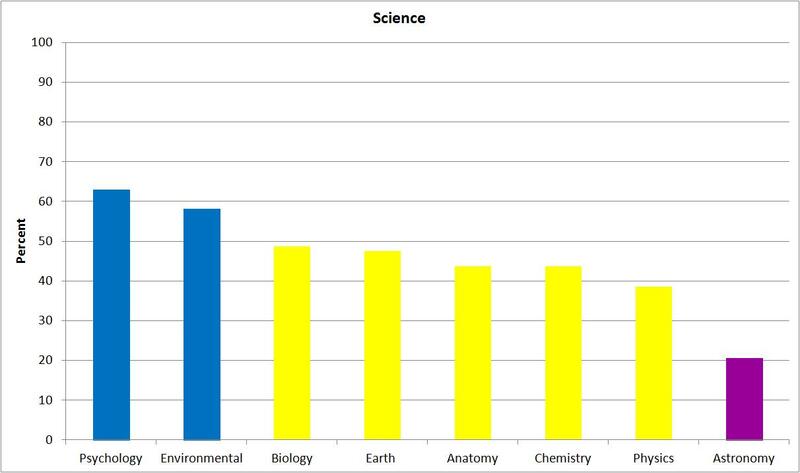 Knowledge of computers and finance were scored closely below these. Implications: The results suggest that students who become bilingual may have an advantage in the work world. Many graduates said that they were introduced to Spanish in school but wished they had become fluent. This suggests that students should not stop at the minimum foreign language requirement but should continue learning until they are proficient in the language. 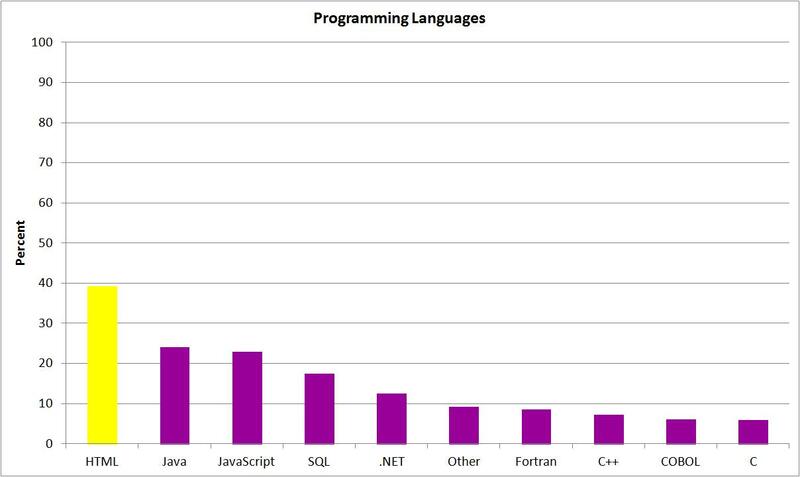 Knowledge of computers, especially computer skills (typing, using Excel, etc.) were commonly listed skills that people wished they had learned. Technology has changed greatly since many of the graduates were in school, as have school standards, so these results do not necessarily point to a current weakness in the school system. Even so, schools should make sure that programming classes are offered in all high schools and that computer skills are integrated into required classes. Finance was also commonly cited as a subject graduates wished they had been taught. Some high schools have finance courses, but finance courses should become more widespread and be emphasized more strongly. Results: 10.45% reported that they worked in the city where they attended high school. 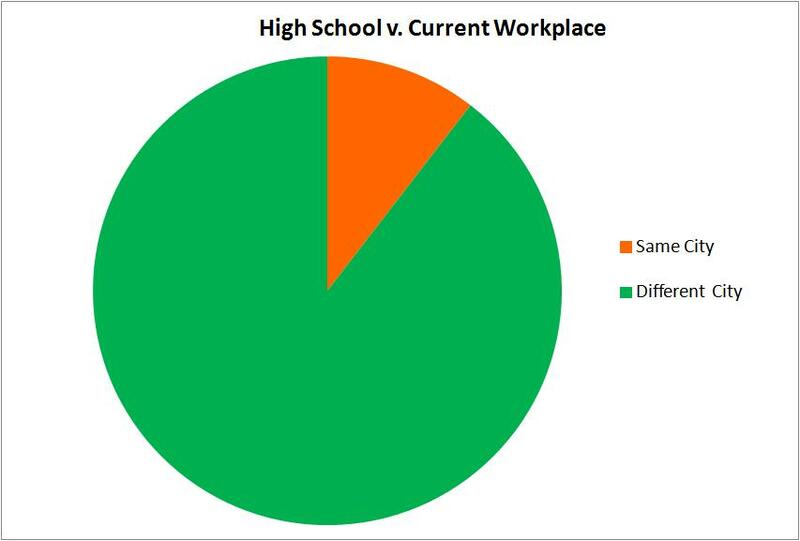 The number would be higher if people whose high school is near their workplace (but not in the same city) were included. Implications: Public education is funded by local, state and federal governments. Since the vast majority of students will not live and work in the city in which they attended high school, it seems more appropriate for state and federal governments to fund education than local governments. Internship programs may direct students toward local jobs, increasing the number of students who eventually work in their hometown. Alternatively, internship programs could acknowledge that most students are likely not to remain in the area by linking students to a wider base of businesses, including those outside their city, and by teaching them knowledge which they can carry to any business in the field. 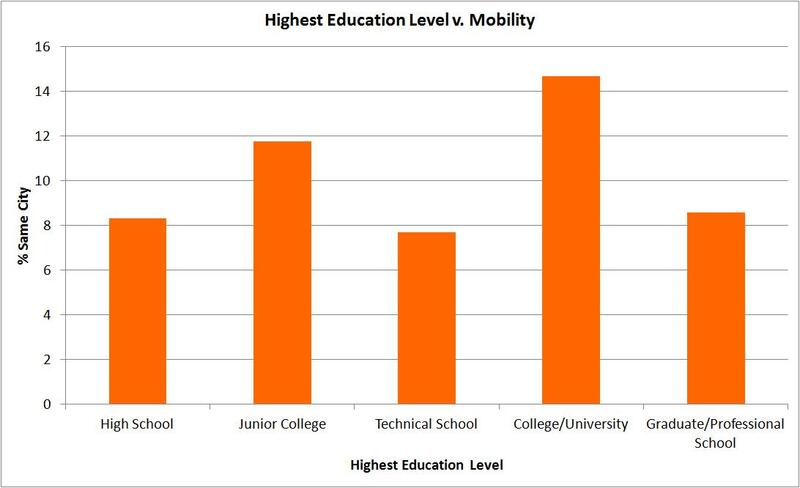 The percentages of people who worked in the city where they attended high school were compared with the highest education level of the respondents to see if there was a correlation between education level and mobility. Results: Although it seemed likely that graduates with higher education levels would be less likely to work in the city where their high school was located, because of their increased job opportunities in more areas, there was no correlation between education level and mobility. 1. People recognize the subjects that they use in life or work. If they do not recognize that what they are doing is an application of classroom information, they may not report it. 2. The survey respondents were a representative sample of the population. Some of the results are heavily influenced by the sample of graduates, such as the importance of learning Spanish in a majority California group. Since a large percentage of respondents were government/military workers, the results are skewed heavily toward subjects used in government jobs. 3. People answered questions in the context of the industry in which they worked longest. We assumed that a man who spent most of his life as a musician, but recently became an engineer would answer questions about the subjects he used based on this time as a musician. However, some people may have included subjects used only in their current job. 4. The graduates answered all questions accurately. If some people did not accurately answer each question, possibly to avoid downplaying the importance of certain subjects in school, certain subjects might have an artificially high percentage of people who report they use them. 5. People interpreted questions the same way. When the questions were written, we intended that graduates would only mark subjects which taught them skills that directly helped them succeed in life or in the workplace. However, if they included subjects which gave them pleasure or a deeper understanding of the world, it is difficult to determine how important a subject is to the lives of graduates. Led by California, states are beginning to encourage and provide schools with funding to partner with businesses to link learning to life. In order to facilitate partnerships between schools and businesses, Tellusthepoint is transitioning from a student project to a formal organization whose mission is to link everything taught in school to the people, products and jobs that use them. We invite you to join us in doing something great.